Spoon Carving First Steps: Finch Foundry. lies the small village of Sticklepath. Staecle is Saxon for steep. Within the village, hard on the old road, you'll find a foundry. It was founded by a man called William Finch. Finch bought the site, which was previously a cloth mill in 1814. Nearly two hundred years ago. William learned his smithing skills at Tavistock foundry. Tavistock is an old stannary town situated to the west of Sticklepath. the foundry was run by his son George. George was one of five brothers. The last Finch to run the foundry was Ralph. He took over in 1945.
and all sorts of gardening implements. I even spotted a Kent pattern axe that was made on site. Some of the tools made at the foundry. One of the chaps that work on site demonstrating to the public told us a story. Steve, shown below, told us that Ralph and the chaps went next door to the pub at lunchtime one day in the sixties. No sooner had the pints been pulled than there was a huge bang and a crash. Everyone piled outside to find the top story of the foundry had collapsed and covered all of the machinery in rock and lime. Luck would have it that no one was hurt, but that put paid to the foundry. 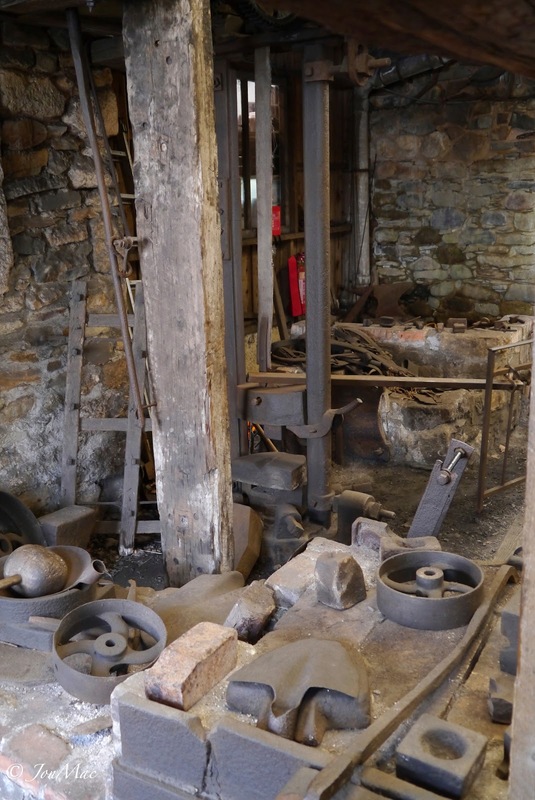 In it's hay day the foundry produced around 400 tools per day. Time was called on the foundry. 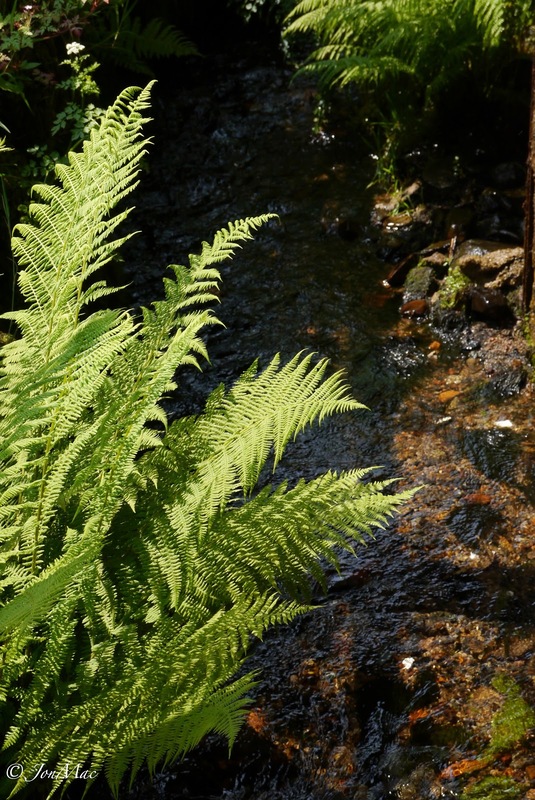 In the seventies the 'Finch Foundry Trust' was formed and work started to restore the whole site. The site is now owned and run by the 'National Trust'. Steve runs us through the history of the foundry. The makers at the foundry used both mild steel and high carbon steel in cutting edge production. 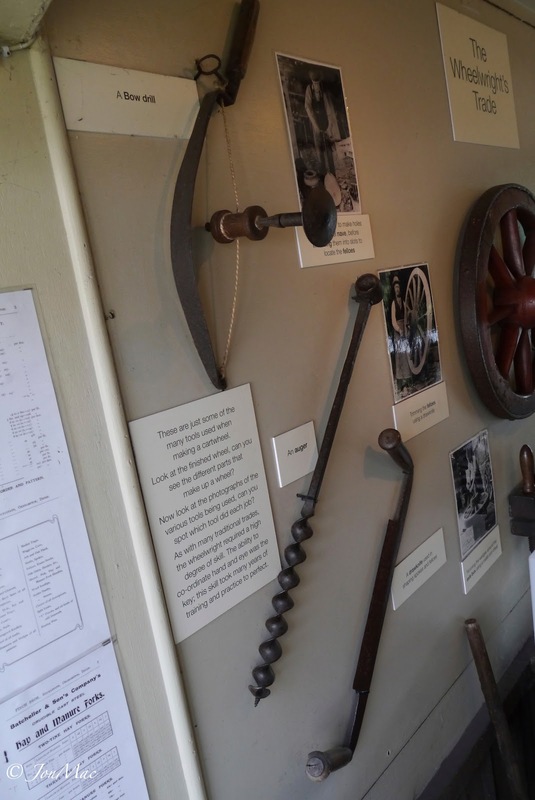 The high carbon steel came from Sweden, and back in the day was very expensive. Later, the high carbon steel was bought from the steel mills in Sheffield, south Yorkshire. The high carbon will keep a good cutting edge, the mild steel is softer. So the smiths would make a sandwich, a bar of high carbon set between two of mild steel. When the edge was put on the cutting tool the high carbon would be revealed, giving you a good, long lasting edge. 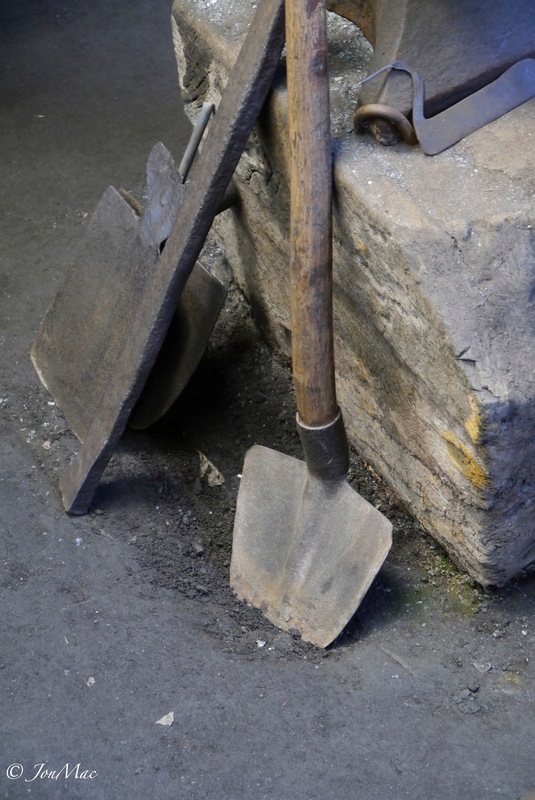 Not to be confused with a Cornish shovel. I'm proud to say I've been on the business end of both. 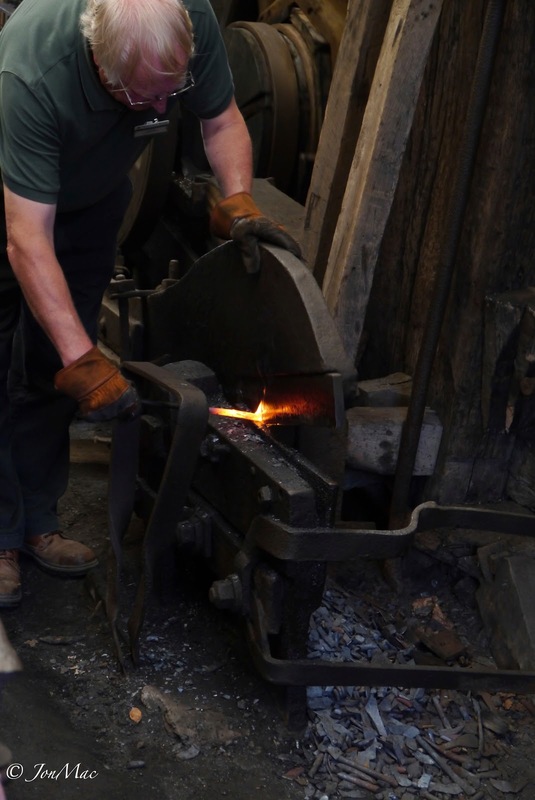 Many repair jobs were taken on in the foundry. The foundry isn't tidied up or gentrified. It is left as it would have looked, with jobs lined up against the walls, cobwebs and dust are your companion. 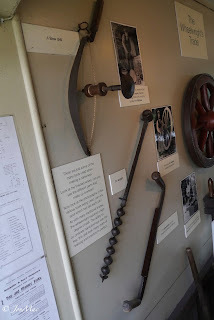 A motor vehicle wheel, harrow disk and belt pulley. Old hooks and a lamp. There were a couple of different large hammers at the foundry. 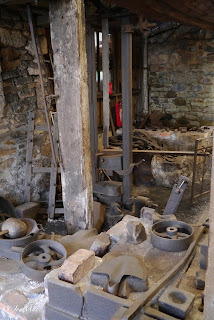 The picture below shows the forge in the background. 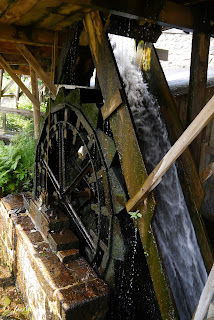 The wind for the forge is provided by one of the waterwheels on site. Piped under the floor of the foundry. 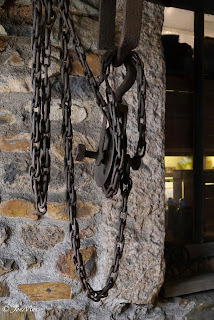 In the foreground you can see a bell pull on the left and a leather belt on the right. Below is a model of the device shown above. 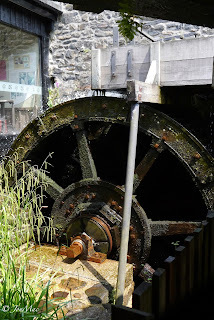 The drive wheel at the top is rotated via another waterwheel and geared appropriately. With the drive wheel spinning the operator pulled gently on the rope. 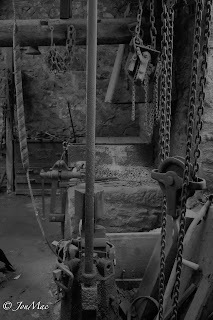 The friction between pulley and belt increased until the hammer would rise with little effort on the part of the operator. Once the hammer is high enough the operator lets go of the rope and the hammer drops. Another drop hammer toward the rear of the workshop. Side view of the drop hammer. A smaller waterwheel that powers the air pump. Below you can see the belted gearing wheels that spin the air pump. You may just make out the extra sprocketing on the big wheel on the right, they increased the diameter of the wheel to gear up the air pumps speed, to increase the amount of air available. The gearing mechanism for the air blower. Steve gave us a demonstration of the smaller of the two large tilt hammers in operation. Here you can see the drive belts running above the work space. 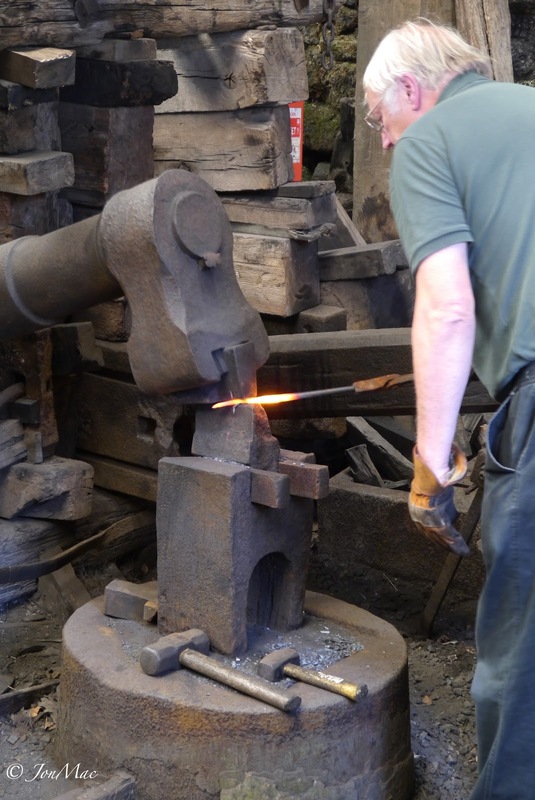 The tilt hammer itself was carted up to Finch foundry two hundred years ago. But the hammer itself was old technology even before it struck it's first blow at Sticklepath. 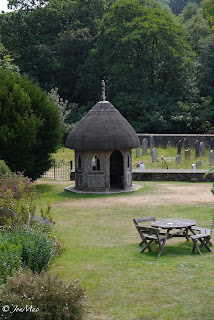 The hammer had been operating for a few hundred years at Tavistock before it found it's new home. 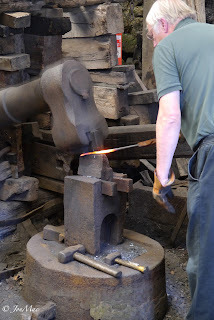 (I had a chat with Martijn Top, we visited the foundry together in the heat of an English heat wave. 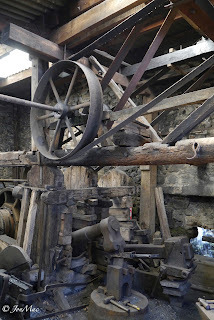 It's probably the oldest piece if machinery I've ever seen anyway. You can see the large hammer and water passing into the tail race through the opening. 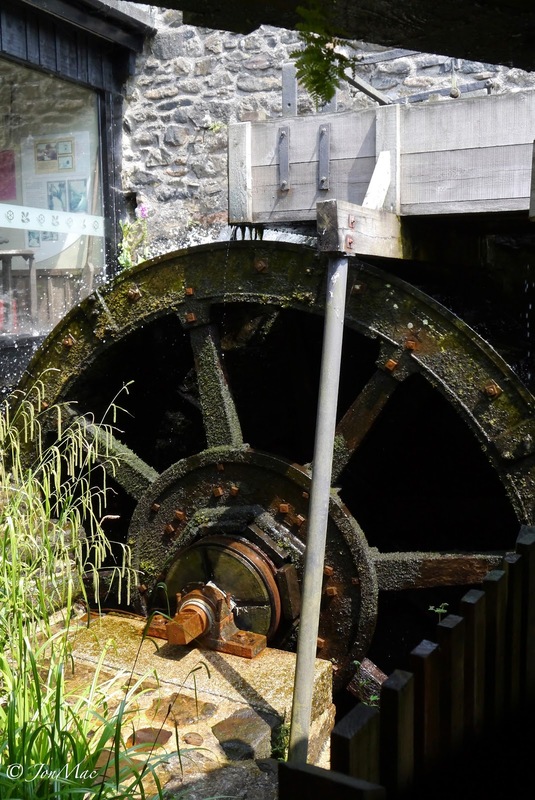 The two big tilt hammers are driven by a large over shot water wheel. 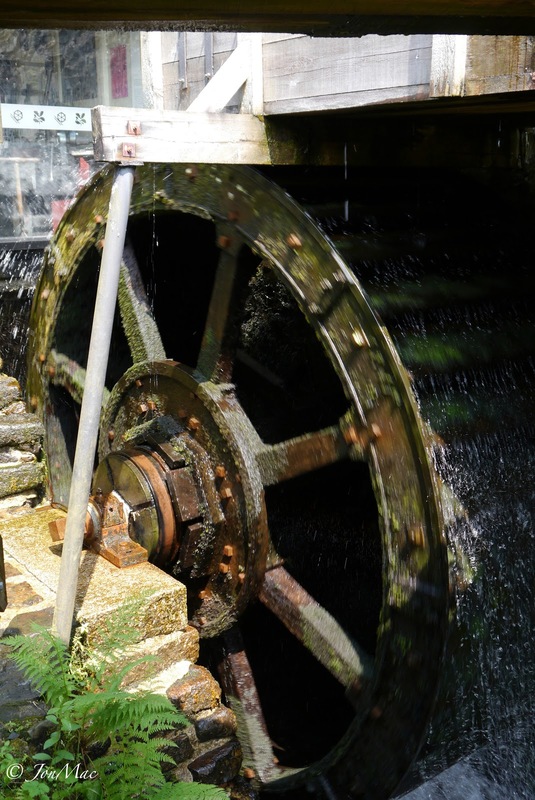 Here is a shot of the launder that delivers the water to a point just passed top dead centre of the wheel. 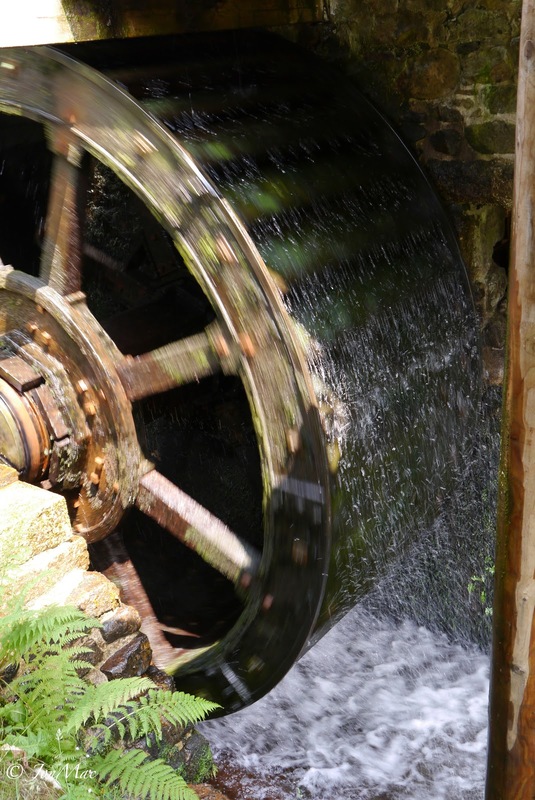 An overshot wheel gives greater power than a wheel dangled into a stream. Below is a model of the principle workings of the tilt hammer. The wheel at the centre is turned, one of the large cams actions the but end of the hammer. Two fifths of the way up the shaft is a fulcrum. The but end of the shaft is depressed, lifting the hammer head. Once the hammer head is lifted, the large cam passes and releases the head to drop onto the anvil. Model of the tilt hammer. Here you can see Steve cutting a steel bar using the mechanically operated shears on the side of the main hammer assembly. 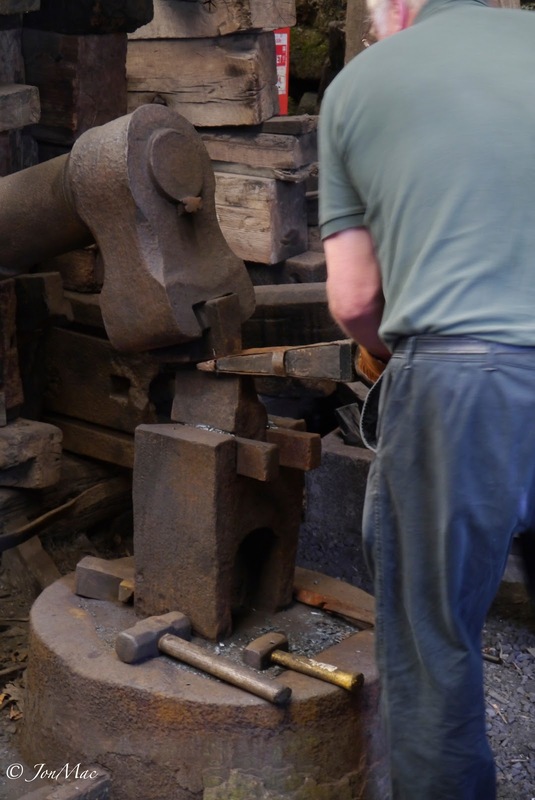 The hammers weigh three quarters of a ton and one and one quarter of a ton. The last time the larger tilt hammer was used the reverberation took all the glasses off the shelves in the next door pub. The smaller hammer can still be operated although it has been choked back to reduce damage to both the foundry itself and the surrounding buildings. Once Steve had finished with the hammer he replaces the wedge, effectively turning the hammer off. At the working end you can see the large cams that push down on the hammer 'handle'. Here you can see the water wheel powering the hammers. The water is bought to the foundry and it's wheels by a large wooden launder. 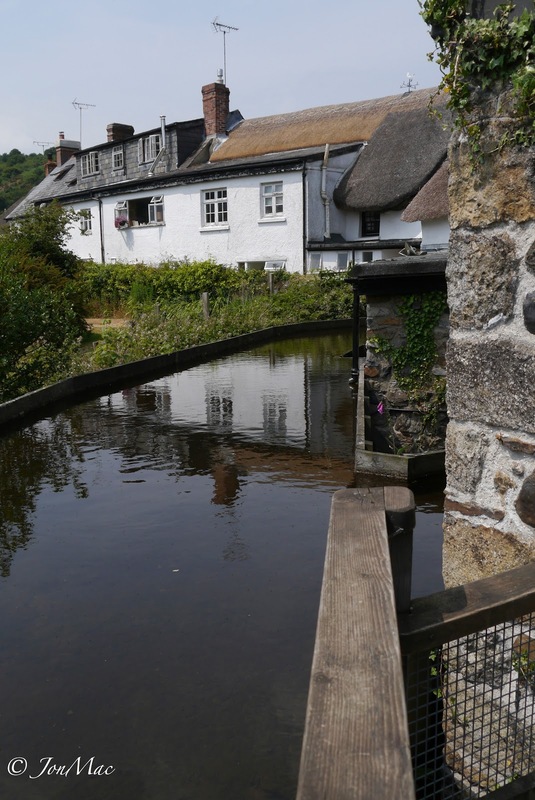 The launder is filled from a leat take-off on the river Taw and passes behind the houses and pub this side of the main high road. 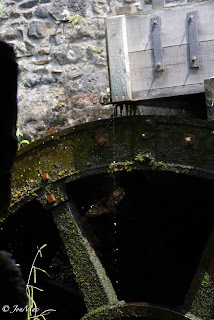 One of the water wheel 'switches'. 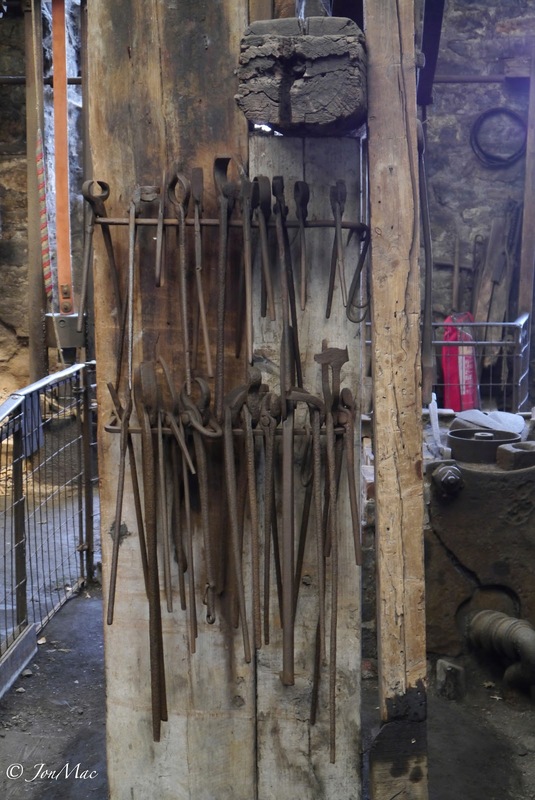 Some of the tongs used in the foundry. To the side of the foundry we found the grinding and carpenters workshop. Here you can see a large wet grinding wheel with a plank set above the wheel. 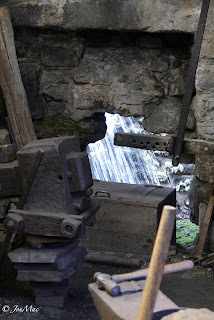 The fellow who sharpened the forged tools would lay down on the plank and reach over to set the tool edge on the wheel. 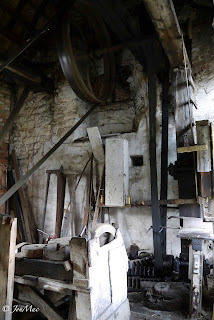 The drive pulleys in the grinding room. 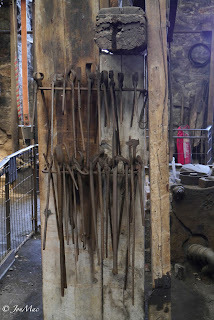 Here you can see a scythe and a collection of sickles. 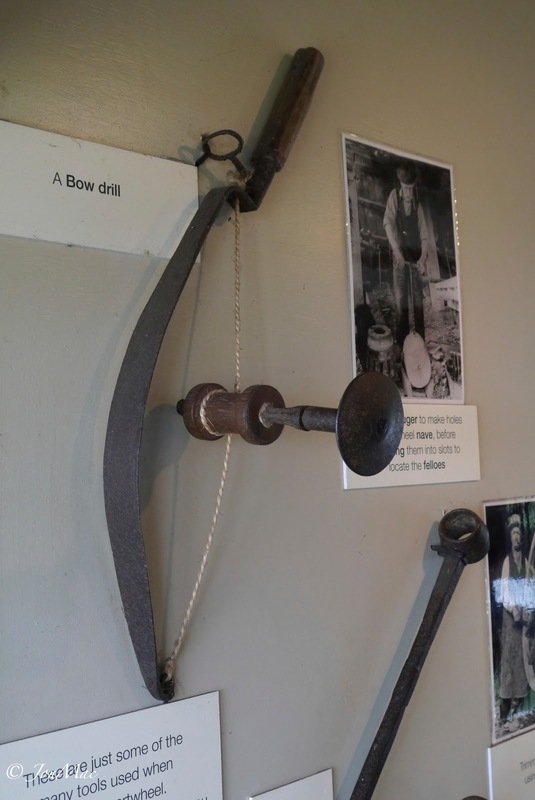 Bottom right is a Kent patterned axe. From bar on the left to hoe on the right. I found something else of possible interest to my bushcraft friends. Not for firelighting this time but a portable device for drilling steel. 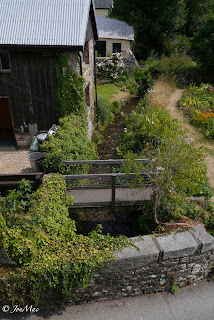 The tail race of the two principle water wheels. In on of the rooms I found many photographs and descriptions of the every day lives of the 'Finch' owners and the folk who worked in the village. I won't post the photos I took as I wouldn't want to involve myself with any copy-write issues. 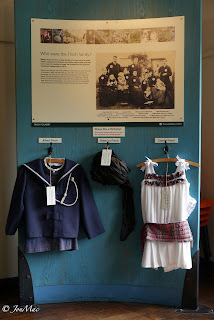 But in this photo you can see the clothing worn by young 'Finches'. 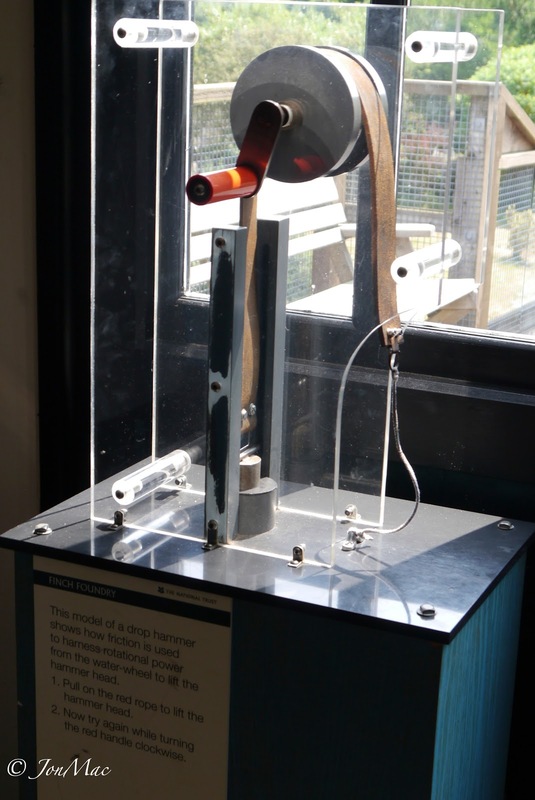 A model of the tilt hammer. My thanks go to the staff at the forge and my good friend 'Martijn Top' who carried out the driving detail. 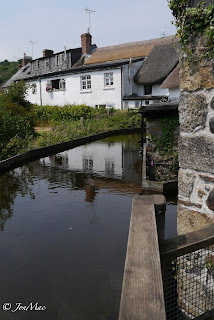 Quite a feat in a tiny left hand drive 'Twingo' on our narrow Devon lanes. Here is a link to a little more in depth information about the foundry.